Congratulations to "Debra S.", the winner of Cheryl's giveaway. Thank you to all who participated! Hi. My name is Cheryl Yeko and I write romantic suspense. I enjoy novels with fast-paced action and steamy romance, protective alpha men and strong heroines. My debut novel was released in December 2011, PROTECTING ROSE, which won the 2012 Gayle Wilson Award of Excellence in romantic suspense. It was a very thrilling time for me. Having never written anything before, I wasn't sure I would be able to write a novel, and was (and still am) on cloud nine to find out that I was able to complete a story that people enjoyed reading. My second novel, A MAN TO TRUST, was just released and I’m hoping folks enjoy this story as well. My current WIP is tentatively titled, TAKEN. But there are a lot of novels out there with that name and I need to think of something else. This story actually started out as a novella. I was taking a class through Savvy Authors on how to write a sensual novella. I wrote a 20,000 word story and sent it off to my publisher. She liked it, and thought it would be a great story to expand into a full-length novel. So, I did. I'm sitting at about 59,000 words now, and heading into the final action scene. I have to say, it was a very challenging task to take a completed story and expand it. But I did it!! The next and final step is to create a heart-pounding action scene and happily-ever-after ending. I'm very excited about this and want it to rock! 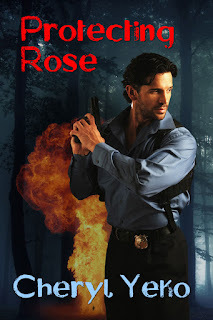 My fourth novel, currently in the works, is the last in the, PROTECTING ROSE, series. It is Rick and Sheila's story, (no title yet) who are both characters from Protecting Rose. Rick is also in, A Man To Trust. My plan is to complete the arc and bring all the characters together one last time. This time, Rick gets the girl! A MAN TO TRUST, is loosely based on a double murder trial that I was a juror on last year. It was a very high profile trial where I live and lasted two weeks. I built a romance between the widow of one of the murdered drug dealers and the lead detective on the case. 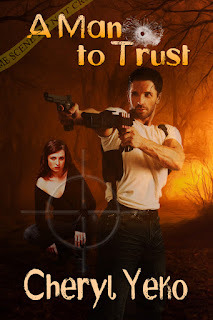 Cheryl will be giving away an eBook of A MAN TO TRUST to one lucky commenter. Giveaway ends 11:59pm EST Dec. 5th. Please supply your email in the post. You may use spaces or full text for security. (ex. jsmith at gmail dot com) If you do not wish to supply your email, or have trouble posting, please email maureen@justromanticsuspense.com with a subject title of JRS GIVEAWAY to be entered in the current giveaway. This sounds like a really good book and look forward to reading it. This book sounds really good! I added it to my TBB list! I loved Protecting Rose and A Man to Trust. Can hardly wait for the next in the series. Terrific post. Good luck with your books. Thank you, everyone, for dropping in with your kinds words! I'm so glad I found this site!! Romantic Suspense is my favorite, right next to Paranormal. Sounds really good - on my wish list now! You are certainly very busy writing. All of your stories sound fabulous. Another new to me author!! Your books sound really great, adding to my ever expanding wish list. Thanks for the chance.